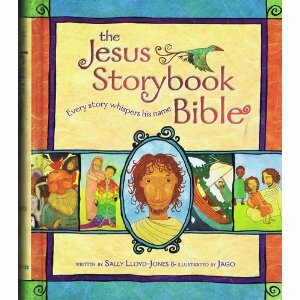 Ages 3-4: At this early age, you just need something that introduces your children to the basic narratives in God’s word. 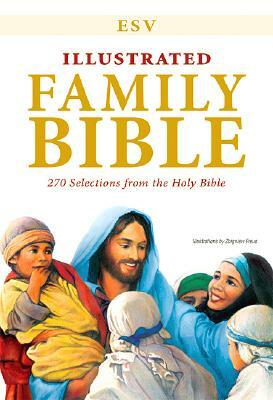 100 Bible Stories, 100 Bible Songs keeps the stories short and has engaging illustrations. It has the added bonus of including a CD with a song for each story. The Early Readers Bible (see below) can also be used for this age. Ages 4-6: My favorite for this age is the The Big Picture Interactive Bible Storybook. It summarizes the key stories well into a one page daily story and ends each lesson with a catechistic question and answer to reinforce the main point. Alternatively The Jesus Storybook Bible is unique in that it shows how every story in the Bible points to Jesus. The stories are short and the book has bright vibrant, playful illustrations that engage young children. If you are teaching your child to read, The Early Readers Bible is a great option. It uses very simple, high frequency words and repeats them often. It also adds new words with each story that then are built upon in future stories. Ages 9-11: At this age, children should be reading larger sections of text to learn about God beyond the action narratives (e.g., David and Goliath). The New Living Translation can help them ease into the complete text with its more readable translation. This Student Life Application Bible is one option in this category. The Children’s Illustrated Bible is a good supplement to the full text. It provides details about history, geography and culture that enhance and explain the background of key events, which aid in understanding the world of 2,000-4,000 years ago. Note that in some cases it tried to apply a naturalistic explanation to miracles, so you’ll need to read it critically. As you read the Bible with your kids, consider a schedule that has you reading the stories six days during the week and then spending the seventh day reviewing what you covered during this time. You may also want to start each of the six days by taking a minute asking questions about yesterday’s text before moving to today’s. This encourages children to listen and articulate what they learned, so you can reread if they missed the key events or message. Spending this extra time reinforces the previous lessons, which is more important than racing forward. This entry was posted in Family and tagged best children's Bible, children's Bibles by age, kids Bible recommendations, which children's Bible should I use. Bookmark the permalink.